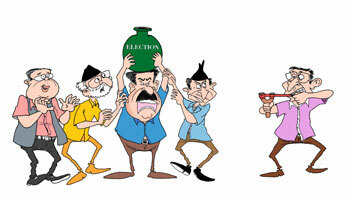 If Nepal was a business, it would have been belly-up by now. Politically, it continues to live on borrowed time. More worrying is the moral bankruptcy of the country’s rulers. We have gone through a succession of autocrats, plutocrats, kleptocrats, and now we are giving bureaucrats a try. But this regime was installed by the four-party syndicate and seems completely beholden to it. It would therefore be too much to expect Chief Justice Khil Raj Regmi to even dare to ask the Attorney General to investigate the widespread and blatant irregularities in the way that the treasury has been plundered by previous Maoist-led governments in the name of the peace process. A file in the Peace Ministry detailing this has been suppressed. The price tag for demobilisation, assimilation, and integration of the former Maoist combatants has come to a whopping Rs 20 billion: more than the country’s annual defence budget. One could argue, as some have, that peace doesn’t have a price. Actually, if we are honest about it, the war already came at a heavy cost. Nepalis shouldn’t be forced to pay for the peace as well. Especially not if those billions went to line the war chests of the comrades who cheated not just the people, but also their own fighters for a revolution that they actually believed in. As Rameswor Bohara’s investigative story on page 16-17 reveals, much of the Rs 20 billion was siphoned off, embezzled, double-billed, over-invoiced, or simply stolen. The largest chunk went for the allowance of phantom Maoist ‘combatants’, whose numbers were vastly inflated to make sure there would be more to steal. Every ex-combatant also had to pay a levy to the party amounting to 20 per cent of their monthly allowance. When UNMIN left, the re-verification team found that 2,456 so-called ‘ex-guerrillas’ had gone ‘missing’. Maoist administrators in the camps had been collecting Rs 4 billion in allowances for fighters who didn’t exist for four years. The only tangible benefit that the state accrued from the Rs 20 billion was the 1,421 ex-guerrillas who were finally inducted into the Nepal Army last month. If you want to understand why Nepal is still poor, there is your reason. With this kind of plunder and impunity, the country doesn’t stand a chance. The war may have ended, but the wounds have not healed. Especially not for the parents of Krishna Adhikari of Fujel in Gorkha who had been protesting outside Baluwatar since January seeking justice for the murder in of their son in 2003 in Chitwan. Police removed them and threw them into a mental asylum and then trucked them back to Gorkha. The Adhikaris are back and have been on a hunger strike. The National Human Rights Commission this week instructed the Home Minister to act on the case, but every day that passes by, Nanda Prasad and Ganga Maya Adhikari grow more frail. Krishna Adhikari had gone to Chitwan to see his SLC results when he was captured by the Maoists, tortured, put into a sack, and dragged behind a motorcycle along the highway and then shot. The Adhikaris filed a police complaint in Gorkha against prominent Maoists, including Januka Poudel and Chhabilal Poudel, but were hounded out of their homes for doing that. As is often the case, the Maoist first denied everything, then they said this was a case of local enmity, later the accused said they had alibis, and on Tuesday Maoist leader Pushpa Kamal Dahal accused human rights activists of trying to tarnish his party at election time, and finally they said ‘the army also killed people’. According to Supreme Court orders, the police is duty-bound to investigate war crimes that have been reported even in the absence of a TRC. But the state, which is now made up of the former enemies, has tried to brush war crimes by both the security forces and the rebels under the carpet just like the murders of Dekendra Thapa and Ujjan Shreshta. An apology may be asking too much from former revolutionaries for plundering the country’s coffers and for past crimes. They have shown no remorse, and on the contrary continued to threaten families of victims and activists seeking justice. After murdering a whole lot of people, they looted the country, and they still think they can get away with it.